This widespread ecological system occurs throughout much of central Montana, and north and east onto the western fringe of the Great Plains. In central Montana, where this system occurs on both glaciated and non-glaciated landscapes, it differs slightly, with more summer rain than winter precipitation and more precipitation annually. Throughout its distribution, soils are typically deep and non-saline, often with a microphytic crust. Overall shrub cover may be as low as 10 percent, or as high as 25%, but this system is always dominated by perennial grasses and forbs with greater than 25% cover. In Montana and Wyoming, stands are more mesic, with more biomass of grass, and have less shrub diversity than stands farther to the west, and 50 to 90% of the occurrences are dominated by Wyoming big sagebrush with western wheatgrass (Pascopyrum smithii). Japanese brome (Bromus japonicus) and cheatgrass (Bromus tectorum) are indicators of disturbance, but cheatgrass is typically not as abundant as in the Intermountain West, possibly due to a colder climate. The natural fire regime of this ecological system maintains a patchy distribution of shrubs, preserving the steppe character. Shrubs may increase following heavy grazing and/or with fire suppression. In central and eastern Montana, complexes of prairie dog towns are common in this ecological system. This system occurs throughout central and southeastern Montana, usually at elevations between 1,500 and 2,300 meters (4,921-7,546 feet). It also occurs throughout much of the Columbia Plateau and northern Great Basin, east into the Wyoming Basins, and north and east onto the western fringe of the Great Plains in Montana and South Dakota. Approximately 43,271 square kilometers are classified as Big Sagebrush Steppe in the 2017 Montana Land Cover layers. Grid on map is based on USGS 7.5 minute quadrangle map boundaries. This system occurs as extensive matrix types on level to gently rolling plains, plateaus, sideslopes and toeslopes, and as small and large patches in dissected landscapes such as breaks and badlands. Soils are alkaline and are developed from various parent materials that have weathered to predominantly heavy-textured, clay-rich Aridisols, and in more mesic conditions, Mollisols. In central Montana, this system differs slightly, with more summer rain than winter precipitation, more precipitation annually, and it occurs on glaciated and non-glaciated landscapes. Across the Montana distribution, soils are typically deep and non-saline, often with a microphytic crust. In southeastern Montana, these sites are associated with heavy soils. In north-central Montana, soils tend to be shallower often with gravelly or claypan surfaces. 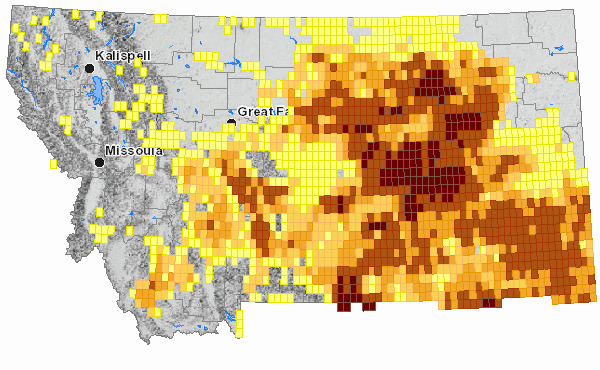 In Montana, this system is dominated by Wyoming big sagebrush (Artemisia tridentata ssp. wyomingensis). Other shrubs present may include basin big sagebrush (Artemisia tridentata ssp. tridentata), silver sagebrush (Artemisia cana), greasewood (Sarcobatus vermiculatus), saltbush (Atriplex species), rubber rabbitbrush (Ericameria nauseosa), green rabbitbrush (Chrysothamnus viscidiflorus), and antelope bitterbrush (Purshia tridentata). Overall shrub cover is less than 10 percent. Perennial herbaceous components typically contribute greater than 25% vegetative cover and consist mostly of rhizomatous and bunch-form graminoids, with a diversity of perennial forbs. In Montana, the dominant graminoid in this system is western wheatgrass (Pascopyrum smithii). Other species include Indian ricegrass (Achnatherum hymenoides), blue grama (Bouteloua gracilis),Sandberg’s bluegrass (Poa secunda), or bluebunch wheatgrass (Pseudoroegneria spicata). Dryland rhizomatous sedges such as threadleaf sedge (Carex filifolia) and needleleaf sedge (Carex duriuscula) are very common and important in the eastern distribution of this system in Montana and Wyoming. Common forbs include Hood’s phlox (Phlox hoodii), sandwort (Arenaria species), prickly pear (Opuntia species), scarlet globemallow (Sphaeralcea coccinea), purple prairie clover (Dalea purpurea), gayfeather (Liatris punctata), and milkvetch (Astragalus species). Within this system, cheatgrass (Bromus tectorum), Japanese brome (Bromus japonicus) and other invasive weeds can be abundant where there is frequent disturbance. The natural fire regime of this ecological system maintains a patchy distribution of shrubs, so the general aspect of the vegetation is steppe grassland. Shrubs may increase following heavy grazing and/or with fire suppression. Response to grazing can be variable, depending on the type of grazer and the season in which grazing occurs. Needle and thread (Hesperostipa comata) can increase in abundance in response to either grazing or fire. Microphytic crust is very important in this ecological system and is easily damaged under all grazing regimes.In central and eastern, complexes of prairie dog towns are common in this ecological system, and can be a significant disturbance. Big sagebrush is easily killed by fire at all intensities, and when exposed to fire, plants do not resprout (Wright et al. 1979). In southwestern Montana, Wambolt and others (2001) found that fire in big sagebrush is stand replacing, killing or removing most of the aboveground vegetation, and that recovery to pre-burn cover (of sagebrush) takes at least 20 years. In Montana, Wyoming big sagebrush may require a century or longer to recover from fire (Lesica et al. 2005). Heavy grazing practices can also lead to a decrease in associated grasses and an increase in the spread of annual bromes. Sites infested with annual bromes are changing the dynamics of this system by increasing fire potential, severity and spread. In the absence of natural fire, periodic low intensity prescribed burns can be used to maintain and restore this system to similar pre-settlement conditions. Low intensity prescribed fire is used to reduce sagebrush cover; in order to increase herbaceous forage and improve habitat quality for sage grouse and other wildlife by creating a mosaic of burned and unburned patches. Excessive grazing can result in the demise of the most common perennial grasses in this system and lead to an abundance cheatgrass or Japanese brome. Successful restoration of native grasses within this system may be limited to sites where pre-fire cheatgrass cover was low. Fall germination and rapid elongation of roots provide cheatgrass with a competitive advantage over native perennial species (Harris 1967). In trials, cheatgrass reduced growth of bluebunch wheatgrassseedlings and was capable of producing twice the root quantity of bluebunch wheatgrass during the first 45 days of growth (Aguirre and Johnson, 1991). Prolific seed production also contributes to the competitive advantage of this species over native grasses. However, some selections of bluebunch wheatgrass exhibit desirable growth characteristics that hold promise for establishing this species on cheatgrass-infested sites. Severely burned sites may require replanting with mountain big sagebrush seedlings due to slow recovery time and low rates of natural seedling recruitment. Generally, larger container volume of nursery stock results in higher outplanting success; 10 to 20 cubic inch container stock is recommended. Wyoming big sagebrushhas been shown to have subspecies and ecotypes that are morphologically and ecologically distinct. Collecting seeds from the appropriate subspecies in the proposed out-planting site is recommended (Mahalovich and McArthur, 2004). The geographic ranges of each subspecies should serve as the geographic boundary for each seed collection zone, with the additional restriction that seeds and plants should not be moved further than 483 kilometers (300 mi) to a target planting site, or outside their native distribution. These seed transfer guidelines are an indication of the habitat requirements of the subspecies. Polyploidy is also an important factor in adaptation. Polyploidy can influence plant fertility and vigor, and polyploidy patterns are evident at the ecotonal interfaces and within populations. Polyploids are better adapted to extreme ecological environments than diploids (Sanderson et al, 1989; McArthur and Sanderson, 1999). Thus, specific ecotypes or ploidy level of Wyoming big sagebrush may also be useful for selecting seed sources for outplanting, especially on droughty or mineral soils (Mahalovich and McArthur, 2004). Aguirre, Lucrecia, and Douglas A. Johnson. 1991. "Influence of Temperature and Cheatgrass Competition on Seedling Development of Two Bunchgrasses". Journal of Range Management. 44 (4): 347-354. Harris, G.A. 1967. Some competitive relationships between Agropyron Spicatum and Bromus tectorum. Ecological Monographs 37:89-111. Lesica, P., S.V. Cooper, and G.M. Kudray. 2005. Big sagebrush shrub-steppe postfire succession in southwest Montana. Prepared for U.S. Department of the Interior, Bureau of Land Management, Dillon Field Office. Montana Natural Heritage Program, Helena, MT. 29 pp. plus appendices. Mahalovich, Mary F., and E. Durant McArthur. 2005. "Sagebrush (Artemisia spp.) Seed and Plant Transfer Guidelines". Native Plants Journal. 5 (2): 141-148. McArthur, E. Durant, and Stewart C. Sanderson. 1999. "Cytogeography and Chromosome Evolution of Subgenus Tridentatae of Artemisia (Asteraceae)". American Journal of Botany. 86 (12): 1754-1775. Mueggler, W. F. and W. L. Stewart. 1980. Grassland and shrubland habitat types of western Montana. USDA Forest Service Gen. Tech. Rep. INT-66, Intermountain Forest and Range Exp. Sta., Ogden, Utah. 154 pp. Sanderson SC, McArthur ED, Stutz HC. 1989. A relationship between polyploidy level and habitat in western shrub species. In: Wallace A, McArthur ED, Haferkamp MR, editors. Proceedings: symposium on shrub ecophysiology and biotechnology.1987. June 30-July 2; Logan, UT. Ogden, UT: U.S. Department of Agriculture. Forest Service. Intermountain Research Station; p 23-30. Wambolt, C. L., K. S. Walhof and M. R. Frisina. 2001. Recovery of big sagebrush communities after burning in southwestern Montana. Journal of Environmental Management 61: 243-252. Wright, H. A., L. F. Neuenschwander, and C. M. Britton. 1979. The role and use of fire in sagebrush-grass and pinyon-juniper plant communities: A state of the art review. USDA Forest Service General Technical Report INT-58. Intermountain Forest and Range Experiment Station. Ogden, UT.